Simply the best cookies and confections, featuring an unforgettably rich selection of cookies, brownies and gourmet treats that are baked fresh and guaranteed to spread smiles. Cookies - If you can't resist the taste of soft, moist, fresh from the oven baked cookies, you'll love every morsel of Mrs. Fields� exceptional creations, featuring the world's most beloved recipes made using only the finest ingredients. Now, the very same decadent desserts that you love treating yourself to at the mall can be delivered right to your doorstep. Satisfy your own sweet tooth or send an irresistibly delicious gift to your friends, family and loved ones with the best gourmet cookies in classic 3" sizes, mini bite-sized Nibblers, and more unforgettable flavors delivered in collectible signature tins. From traditional chocolate chip to nutty oatmeal raisin, triple chocolate to hand frosted flavors, you'll find a decadent medley of treats to honor any occasion, season or celebration. 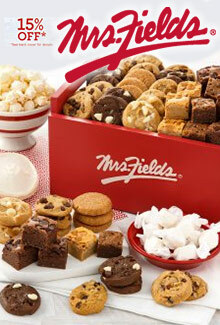 Shop with Catalogs.com's exclusive Mrs. Fields coupon codes to save more on every mouthwatering order. Cakes - Now you can have your cake and eat it too, right out of the box! Spoil your sweeties with colossal twelve-inch decorated cookie cakes that are baked fresh and big enough to satisfy any sized sugar craving. These moist and chewy cookie/cake hybrids are made from the very same time-tested recipe and wholesome ingredients as their signature cookies, hand decorated and personalized with traditional greetings, holiday themes, or your very own special message. Choose from circular or heart shaped sizes available in six different flavors including classic chocolate chip (with or without nuts), creamy peanut butter, triple chocolate, oatmeal raisin and walnut, cinnamon sugar or luscious white chocolate macadamia nut combinations. Gift Baskets - Whether you want to welcome a new family to the neighborhood, send the best gourmet cookies for Christmas, show your appreciation, or cheer up a loved one who is feeling under the weather, treat filled gift baskets are an ideal choice for any occasion, recipient or event. Browse a wide assortment of gift basket sizes overflowing with the yummiest contents and confections ever baked including a sumptuous assortment of their most popular gourmet offerings. Fill your baskets with dozens of Mrs. Field favorites including the best cookies, brownies, mini muffins and nibblers, all presented in reusable baskets, tins and containers for the perfect presentation. Personalization - Give them a gift that was designed especially for them, by you! Treat your gift recipients to personalized cookie tins and personalized ceramic cookie jars that feature your own heartfelt sentiments and photos for a keepsake gift that is even sweeter than the confectionary contents inside. Create your personalized gift with ease thanks to their simple to navigate online custom ordering tool that will allow you to upload and proof your message and/or image(s) for only $4.99 more! Look for money-saving Mrs. Fields coupon codes and/or sign up for their emails to save 10%! That's a sweet deal if we do say so ourselves. For over three delicious decades, Mrs. Fields has served the needs of the sugar loving masses with their famously fresh chocolate cookies and desserts that are moist, chewy, rich, delicious, and loved across the globe.